Consultations: To learn about my consultations, visit this page. The quickest way to schedule a consultation is to visit this page. Please Note: We are not able to provide consultations, counseling, or advice by e-mail. Our e-mail is best used for questions you may have about services, events or products, problems with links, etc. Because I am working full time providing private consultations, designing and facilitating workshops and ocean journeys and writing, I am not able to personally respond to the hundreds of emails received each week. My assistant does keep me abreast of the email messages, and I am deeply touched by and appreciate your stories, your support and your feedback. Though I may not be tapping my keyboard sending you words in response, I do you send blessings of love and thanks. Above: A typical day in the office for me with my cats Natalia and Little K who bring immesaurable joy to every day of my life. To bring comfort, support and resources of healing to humans grieving the loss of their animal loved ones; to honor the death of animals and the grief it brings as a significant and sacred process. To contribute to the pet loss grief support field with an in-depth, comprehensive educational program for professional competency development leading to a certification of completion for those who wish to build or augment their knowledge and skill base in the field of animal loss and grief support. To assist people in enhancing their natural telepathic communication with animals to resolve behavioral problems, emotional issues, and deepen the mutual understanding, intimacy and commitment of the human-animal relationship. To inform people who interact with and love animals about decisions and actions they can take to help them, to inspire them to give back in some way to help the animals of the earth who are in peril. To bring together humans of like values to deepen and celebrate the joy and wonder of the animal/human relationship! To explode the myth that something is wrong with us if we love animals as much as people, that this somehow precludes our ability to have healthy relationships with humans. To support the practice of loving and treating animals as family members and equal spiritual beings as one that is a normal, healthy and life affirming experience. 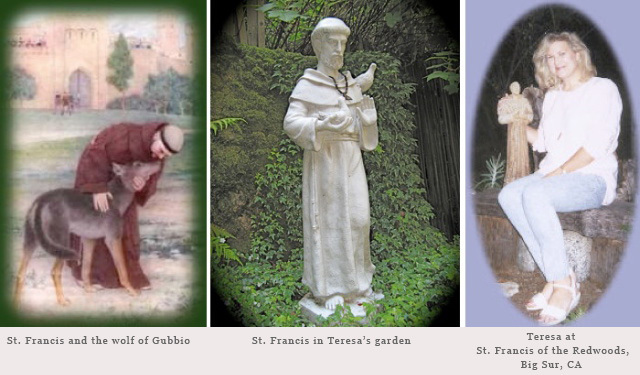 For Teresa, animals and animal issues provide the core meaning, guidance, joy, and purpose of her life. She believes passionately that it is time for our relationship with animals to evolve--beyond the love, companionship, inspiration, joy, exhilaration, wisdom and healing we receive from animals to move on to accelerating our giving back to the animals--by helping those who face and suffer from myriad threats of human activity on the earth. With such reciprocity our relationships with animals are more balanced, mutually healing and whole. Animals are not here to simply give to us. We are here on earth together. Those of us who love animals, and especially those of us who receive so much from them, have a responsibility to give back and help them. 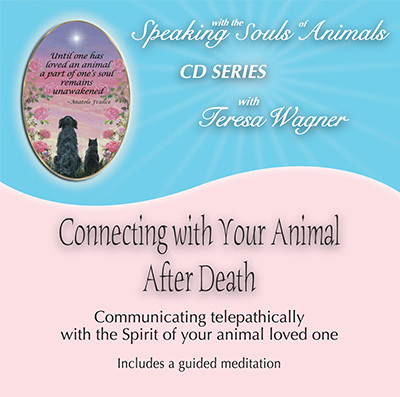 Teresa has been offering grief support services for people who have lost their animals since 1986, and began her professional animal communication work in 1991, though she has talked with animals since her childhood. Today she maintains an active animal communication practice, teaching schedule, and is writing a series of books on our relationship with animals, in addition to her audio book on grief, Legacies of Love, and a series of other educational CDs currently available. 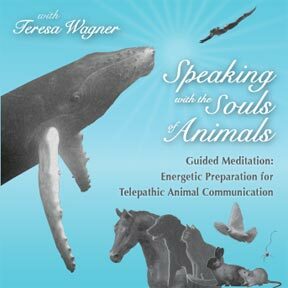 Teresa is a contributing author in the books Animals in Spirit by Penelope Smith and Dolphins and Whales Forever. She also founded and leads the Animal Loss and Grief Support Certification Program—an in-depth program to train pet loss grief counselors. She has worked with thousands of clients in her practice and classes from the United States, Australia, Belgium, Canada, China, Costa Rica, England, France, Germany, Ireland, Israel, Italy, Jamaica, Japan, Korea, Mexico, Namibia, New Zealand, Russia, South Africa, Switzerland, and Taiwan.